There are few things as integral to our existence as the sun. Without that big ball of fire, humanity and virtually all life would cease to exist. But for something so important, it sure can cause a lot of problems. Particularly, the ultraviolet rays that constantly beat down on us can break down the structure of almost any material, damaging its integrity and quality — from our skin to the roofs of our homes. 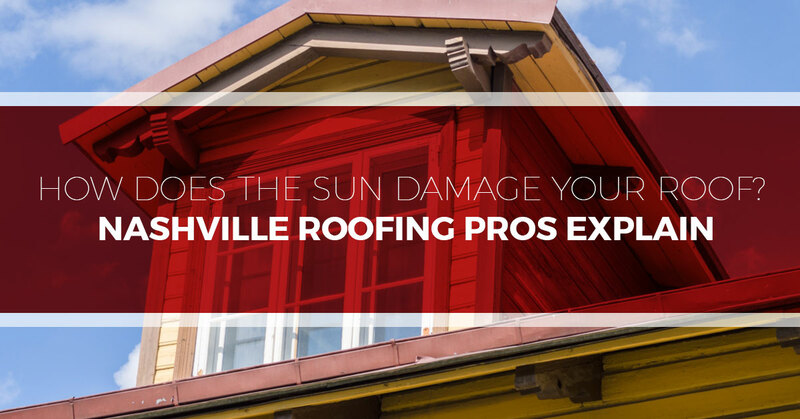 In today’s blog post, we are going to take a closer look at how the sun affects the quality and integrity of your residential or commercial roof, and how you can manage this unavoidable damage and enhance the ability and life of your roof. Tim Leeper Roofing is proud to be Nashville’s preferred roofing company. For years, we have been providing the greater Nashville area with superior commercial and residential roof repairs, replacements, inspections, and more. If your roof needs some attention, give us a call at 615-553-2782 or fill out this online form to get your free, no-hassle estimate. As we all know, the sun beams down the heat, energy, and ultraviolet rays. While your residential or commercial roof has been designed and installed to deal with a barrage of elements, the sun is enemy number one. Even on cloudy days, your roof is still susceptible to UV rays and the accompanying gradual wear-and-tear. While it doesn’t happen overnight, these invisible but pernicious UV rays break down the molecular structure of your roof slowly. In addition, these rays also magnify other damage caused by heat and temperature change. So what kind of damage are we talking here? Though made to withstand direct heat, roof tiles naturally dry out and lose their flexibility. And as the heat and other elements wreak havoc on your roof, the oils that are inside shingles and tiles begin to adapt by changing shape. Specific components of your roof, like the weatherproofing chemicals, wear away, weaken, and eventually dissolve. When this happens, your roof becomes susceptible to holes, leaks, and other structural issues. Below are some specific problems that are associated with sun damage. Warping — Warped shingles are a common effect of sun damage. When shingles warp, they will look curled up or misshapen. For your roof shingles to be effective, they must lie completely flat. This prevents moisture from entering and the wind from causing further roof damage. Splitting — Thermal splitting is easy to spot. As the name implies, it is when shingles show signs of cracks and tears. While this can come about for a number of reasons, sun damage and thermal expansion are two primary causes. Crumbling — When shingles become cracked and dried, this can cause crumbling, which accelerates the decay of your roof. If you notice that your roof is missing chunks or have edges that are ragged, this is a sure sign that your roof has soaked up too much sun. Are you in need of roofing services in the Nashville area? Tim Leeper Roofing is poised to help! Whether you need a full commercial roof replacement or a simple residential roof repair, we have the experience and knowledge to deliver superb type roofing services — the type of services that add value to your home or business for years and years to come. Give us a call at 615-553-2782 or fill out this online form today to get your free, no-hassle quote. Be on the lookout for part two of this blog post — How Can I Protect My Roof From Sun Damage.